NESTLE SHREDDED WHEAT breakfast cereal is made with just one natural ingredient. 100% wholegrain wheat - sown, grown and ripened in Britain. Deliciously crispy, toasted biscuits made using a recipe unchanged since 1893. No artificial colours or flavours, no added salt or sugar. Low in saturated fat. High in fibre. Promotional packs are subject to availability, while stocks last. We cannot guarantee that your delivered pack will carry a featured promotion. 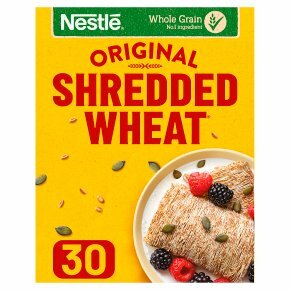 NESTLE SHREDDED WHEAT is made with just one natural ingredient - 100% wholegrain wheat, which is crafted into deliciously crispy biscuits for a mouthwateringly good breakfast cereal for the whole family. Each scrumptious bowlful is low in saturated fat and sugar, contains no artificial colours or flavours and is high in fibre. Our wholegrain wheat is sown, grown and ripened in Britain, using a recipe unchanged since 1893. Nothing more, Nothing less, just 100% natural whole grain. Give your family a delicious breakfast cereal packed with whole grain. Serve with cold or hot milk, and why not try with fresh fruit and yoghurt.